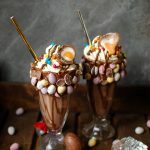 Easter is right around the corner, and the iconic Cadburys Creme Egg is popping up in recipes all over the place and this blog is not one to buck the trend. There’s nothing I won’t do for a creme egg, they’re my absolute favorite Easter treat. In fact, instead of an Easter egg I usually receive a Costco-sized box of creme eggs to munch my way through. I’d love to tell you they last longer than a week, but they rarely do. 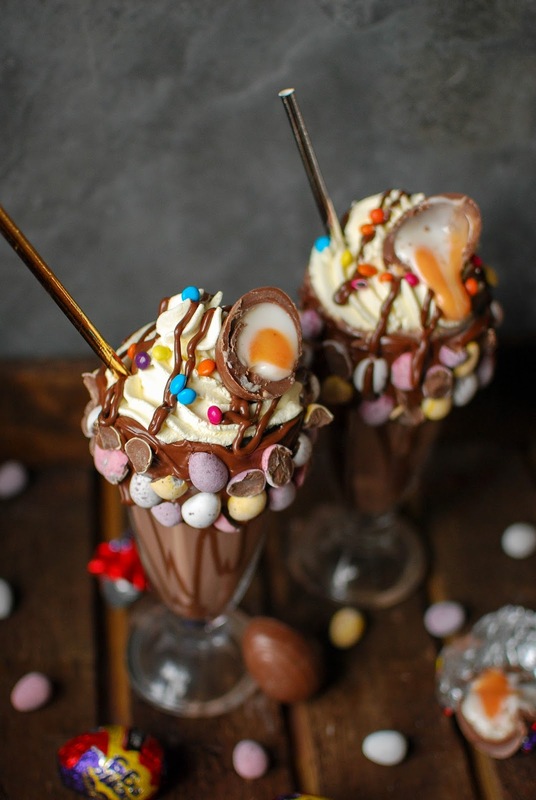 Especially when I get a craving for these Creme Egg Milkshakes, which is more often than I care to admit. 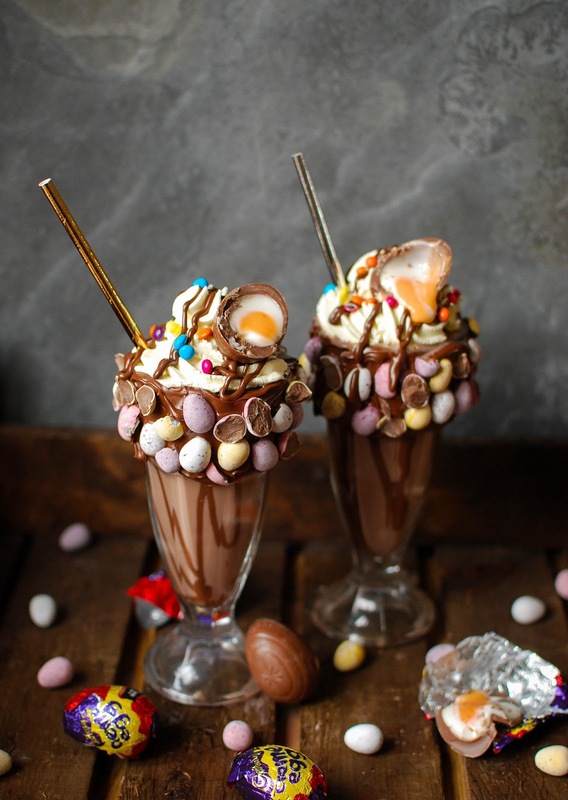 These Creme Egg milkshakes are a super fun way to serve up my favorite Easter treat, and boy are they a piece of cake to make. Just throw everything in a blender, whiz it up and prepare to get messy. I used Nutella to glue the mini eggs to the rim of my glass, but I’m sure melted chocolate will work just as well. You don’t have to go all out on the presentation, but look how fun they look! When you’re making milkshakes from Creme Eggs you may as well go all the way. Chocolate overload! Still needing more Creme Egg action? Why not check out my recipe for Creme Egg Slutty Brownies. Man alive are they awesome! 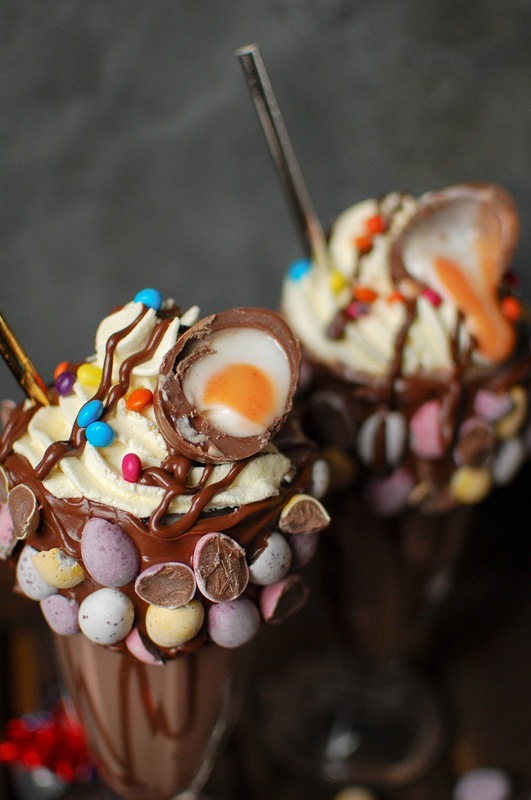 These Creme Egg Milkshakes are the perfect indulgent treat for Easter. First of all prepare your glasses. Scoop out two table spoons of nutella into a heatproof bowl and microwave for 10 second bursts until it’s melted and runny. Pour into a piping bag and pipe swirls of Nutella on the inside of your milkshake glass. Using a teaspoon paint a layer of Nutella around the rim of your glass and roll in the chopped Mini Eggs. To make the milkshake place the milk, ice cream and two of the Creme Eggs in a blender and whizz up until fully liquidised. Pour into your glasses and top with a big swirl of whipped cream and drizzle with the remaining Nutella. Cut the remaining Creme Egg in half and pop it on top of your masterpiece. Wow this looks intense! A very decadent Easter treat! Oh. My. Gosh. So this is what heaven really looks like, huh? I've gotta admit, it's even prettier than I imagined! Need to try this soon!